Energy is vital for our lives: our bodies run on the energy we get from the food we eat, which requires energy to farm, process, transport and cook. Our industries, commerce, education, health-care, communications and recreation all consume energy. But most of this energy comes from burning fossil fuels - coal, oil and gas - which release Carbon Dioxide into the atmosphere, which causes global warming and dissolves into water causing ocean acidification. The terms Energy and Power tend to be used interchangeably to refer to the electricity, oil, gas etc we all consume, and we talk about "wind energy" and "solar power" in the same context. However the terms have specific, different, meanings: energy is the ability to do a certain amount of work e.g. boil a particular quantity of water or move a car a certain distance, and power is the rate at which work is done - how quickly the water is heated or the car travels. Energy and work can be thought of as cause and effect: putting a certain amount of energy into a kettle or a car results in an equivalent amount of heating or movement happening in it. There are various different units for measuring energy (or work) and power. For power probably the most common units are watts (W) (and kilowatts (KW), megawatts (MW), gigawatts (GW) and even terawatts (TW)). For energy common units are watt hours (or more commonly kilowatt hours (KWh)). The "unit" of electricity (used on British electricity meters and bills) is the same as one KWh. Sometimes a quantity of energy (e.g. the amount supplied by a solar panel over a certain period) is wrongly and confusingly stated as so many kilowatts rather than kilowatt hours. Another unit of power based on watts is kilowatt hours per year. Since there are 8,766 hours in a year a power of 1KW (roughly the consumption of a 1 bar electric fire) is 8,766 KWh/y. A unit of energy more often used in scientific work is the Joule, which is one watt second, so 3,600 (60 times 60) joules are a watt hour, and 3.6 megajoules are 1KWh. An older unit of power is the horsepower, which is about 746 Watts. The British Thermal Unit (BTU or BThU) is another old unit of energy, which is mostly obsolete in the UK (though still used in the US). A common measure of energy, usually used on a large, even national, scale, is the Tonne of Oil Equivalent and its multiples such as the mega-tonne of oil equivalent (MTOE). Publicity material and news articles about energy projects often talk about the number of homes they can power. One figure for the amount of power this represents is given by DUKES (source) of 4370KWh per household per annum. This equates to about 0.5kW or 500Watts, so halving the number of "homes" gives the equivalent kilowatts. According to David MacKay the British Wind Energy Association uses the figure 4700kWh per year, equivalent to 0.54kW or 540Watts, and other organizations use 4000kWh/y per household -- 0.46kW or 460Watts. North American usage is higher: Canada's Ontario Power Generation cites "monthly domestic usage of 972 kWh per home" or 1.33kW. MacKay also points out that the “home” unit only covers average domestic electricity consumption of a household, not gas or oil used for home heating, cooking and hot water, the energy that occupants use in their workplaces and for transport, or all the other energy-consuming things that society does for them; all of which add up to roughly 24 times more than a "home". MacKay also discusses other units including "power stations", "cars taken off the road", "calories" barrels, gallons, tons, BTUs, quads, cups of tea double decker buses, Albert Halls and Wembley Stadiums. He also provides this chart for translating power units. The IEA provides an online energy units conversion calculator. Some power sources such as solar photovoltaic, wind, hydroelectric, wave and tide produce electricity directly. Others such as coal, oil, gas, biomass and nuclear produce heat. Heat energy may be used directly - for example for heating buildings, or in industrial processes - or it may be used to generate electricity, in which case only about 1/3 to 1/2 of the heat energy gets turned into electricity. When comparing heat with electricity this conversion may be factored in to allow meaningful comparison of, say, how much fossil fuel is saved by a given amount of hydro, wind or nuclear. This conversion is particularly likely to have been used when "tonnes of oil equivalent" ("toe"s) and their multiples (Mtoes, Gtoes) are quoted, for example in the BP Statistical Review (which uses a conversion factor of 38% - "the average for OECD thermal power generation"). 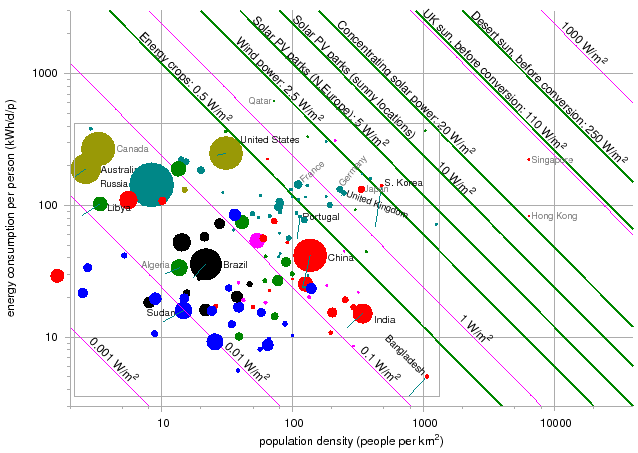 Different parts of the world have different densities of population, and those people use energy at different rates (so in first world cities more energy is consumed in a given area than in rural areas in the developing world). Different sources of energy also have different densities: a 1GW coal, gas or nuclear power station may require a few tens of square kilometres (including the mines or wells needed to supply it) whereas to generate the same power from say, biomass, requires thousands of square kilometres to grow energy crops. When considering what sources of energy could power a given country or region we can compare the energy densities of supply and demand, and David MacKay's Map of the World provides a convenient way of doing so visually for various countries and sources of low-carbon energy. Generators - whether fossil fuelled, nuclear, hydro, wind, solar etc - don't produce electricity (or other forms of useful energy) continuously, 24*7. All mechanical plants can break down, and most are stopped from time to time for inspection and maintenance. Most present day nuclear power stations have to be shut down for refuelling. And hydro, wind, solar, wave and tidal generators can only produce energy when there is the water, wind, sun, wave and tidal conditions they need. The percentage of a generator's maximum ("nameplate") output (pr "installed capacity") which it achieves over a representative period in practice is known as its "capacity factor"; this is typically around 10-20% for solar, 30-40% for wind and around 90% for nuclear and other thermal power stations. Because of the significant difference in capacity factors between - in particular - solar and wind and nuclear, it is misleading to compare installed capacities without compensating for capacity factors. Energy is required in building, operating, maintaining and eventual decommissioning any power generating plant. As long as the plant generates more energy in its lifetime than it consumes it will provide a surplus for useful purposes. The greater the surplus the more it allows society to provide other goods and services - to grow food, to build, heat and cool homes and workplaces, run water and sewerage services, provide education, health care, transport, recreation etc - besides building, maintaining and decommissioning its energy generators. The ratio of energy generated / energy consumed is known as Energy Return On Energy Invested (EROEI, or sometimes EROI) and it is estimated that for a modern civilisation to function the EROEI of its energy supplies in aggregate must be in the region of 10. Even an EROEI less than unity - a system that consumes more energy than it produces - may be useful if it provides services such as storing energy for use when and where it is needed but unavailable, such as to supply energy when demand temporarily exceeds supply, or to convey energy from large fixed generators to electric vehicles. However the overall, aggregate, EROEI of the system of generators and storage systems must still be high enough to allow for a functioning civilisation. Stanford scientists have developed a novel way to calculate the energetic cost of building large batteries and other storage technologies for the electrical grid. In a decarbonized world that is renewable-powered, the land area required to maintain today's British energy consumption would have to be similar to the area of Britain. A new study by Ferroni and Hopkirk estimates the ERoEI of temperate latitude solar photovoltaic (PV) systems to be 0.83. Last week’s post on The Energy return of Solar PV caused quite a stir. Yesterday I received a response to some of the comments from Ferroccio Ferroni and Robert Hopkirk addressing some of the queries raised by readers. Their response is given below the fold. But first I have a few comments to add. There is a fast growing interest in better understanding the energy performance of PV technologies as evidenced by a large number of recent studies published on this topic. The goal of this study was to do a systematic review and a meta-analysis of the embedded energy, energy payback time (EPBT), and energy return on energy invested (EROI) metrics for the crystalline Si and thin film PV technologies published in 2000–2013. A total of 232 references were collected of which 11 and 23 passed our screening for EPBT/EROI and embedded energy analysis, respectively. Several parameters were harmonized to the following values: Performance ratio (0.75), system lifetime (30 years), insolation (1700 kWh m2 yr1), module efficiency (13.0% mono-Si; 12.3% poly-Si; 6.3% a:Si; 10.9% CdTe; 11.5% CIGS). The embedded energy had a more than 10-fold variation due to the variation in BOS embedded energy, geographical location and LCA data sources. The harmonization narrowed the range of the published EPBT values. The mean harmonized EPBT varied from 1.0 to 4.1 years; from lowest to highest, the module types ranked in the following order: cadmium telluride (CdTe), copper indium gallium diselenide (CIGS), amorphous silicon (a:Si), poly-crystalline silicon (poly-Si), and mono-crystalline silicon (mono-Si). The mean harmonized EROI varied from 8.7 to 34.2. Across different types of PV, the variation in embedded energy was greater than the variation in efficiency and performance ratio suggesting that the relative ranking of the EPBT of different PV technology today and in the future depends primarily on their embedded energy and not their efficiency. How Long Does It Take to Pay Off a Tesla Powerwall? In 2009, in the comments to this post on The Oil Drum we stumbled upon a mine of information on the operation of the Rossing uranium mine in Namibia. The data table provided numbers for the amount of energy used on site together with the amount of uranium mined. This provided an opportunity to calculate the energy return of the mining operation. Simply put ERoEI = energy contained in the U / the energy used to mine and refine it. There are some complexities but back then I calculated an ERoEI of 1200:1 The data has been updated and fresh calculations are presented below. The ERoEI of High Altitude Wind Power Euan Mearns; Energy Matters; 29 Jun 2016 For several weeks I have been researching and writing a review post on high altitude wind power. It has grown into a 6000 word monster that should hopefully fly on Monday. While doing this it has been difficult to find time to write other posts. Hence this is a preview of one section on Energy Return on Energy Invested (ERoEI) which makes a nice post in its own right. KiteGen have presented a back of the envelope style ERoEI calculation for their 3 MW stem indicating a value of 562 which is incredibly high. I have done my own calculation using a variant of their methodology and my own input variables. The idea is to try and estimate the energy intensity of a wind turbine structure and to interpolate that into a KiteGen stem. This involves making many weak assumptions but should be good for arriving at a ball park number. Advocates of wind and solar power often point to low or negative prices for electricity in wholesale markets with a heavy reliance on those sources as representing success, but this reflects their ignorance of the utility system and basic economics and is misleading as to the true cost of power from these sources. Life Cycle Analysis, focused on energy, is useful for comparing net energy yields from different methods of electricity generation. Nuclear power shows up very well as a net provider of energy, and only hydro electricity is closely comparable. External costs, evaluated as part of life cycle assessment, strongly favour nuclear over coal-fired generation. Energy Return on (energy) Investment is a way of measuring relative inputs and outputs. Several recent analyses of the inputs to our energy systems indicate that, against expectations, energy storage cannot solve the problem of intermittency of wind or solar power. Not for reasons of technical performance, cost, or storage capacity, but for something more intractable: there is not enough surplus energy left over after construction of the generators and the storage system to power our present civilization. The problem is analysed in an important paper by Weißbach et al. The Energy Returned on Invested, EROI, has been evaluated for typical power plants representing wind energy, photovoltaics, solar thermal, hydro, natural gas, biogas, coal and nuclear power. The strict exergy concept with no ”primary energy weighting”, updated material databases, and updated technical procedures make it possible to directly compare the overall efficiency of those power plants on a uniform mathematical and physical basis. Pump storage systems, needed for solar and wind energy, have been included in the EROI so that the efficiency can be compared with an ”unbuffered” scenario. The results show that nuclear, hydro, coal, and natural gas power systems (in this order) are one order of magnitude more effective than photovoltaics and wind power. Measurement of life-cycle greenhouse gas emissions involves calculating the global-warming potential of electrical energy sources through life-cycle assessment of each energy source. The findings are presented in units of global warming potential per unit of electrical energy generated by that source. The scale uses the global warming potential unit, the carbon dioxide equivalent (CO2e), and the unit of electrical energy, the kilowatt hour (kWh). The goal of such assessments is to cover the full life of the source, from material and fuel mining through construction to operation and waste management. In 2014, the Intergovernmental Panel on Climate Change harmonized the carbon dioxide equivalent (CO2e) findings of the major electricity generating sources in use worldwide. This was done by analyzing the findings of hundreds of individual scientific papers assessing each energy source. For all technologies, advances in efficiency, and therefore reductions in CO2e since the time of publication, have not been included. For example, the total life cycle emissions from wind power may have lessened since publication. Similarly, due to the time frame over which the studies were conducted, nuclear Generation II reactor's CO2e results are presented and not the global warming potential of Generation III reactors, presently under construction in the United States and China. Other limitations of the data include: a) missing life cycle phases, and, b) uncertainty as to where to define the cut-off point in the global warming potential of an energy source. The latter is important in assessing a combined electrical grid in the real world, rather than the established practice of simply assessing the energy source in isolation. Using data from the Energy Institute’s 2016 Full Cost of Electricity Study, we estimate the levelized carbon intensity for 12 different fuel and technology combinations for newly constructed power plants. The levelized carbon intensity is estimated by dividing a power plants’ emissions over its lifetime by the total expected electricity output. We estimate that nuclear and wind power, at 12 and 14 g CO2-eq (grams of CO2 equivalent) per kWh of electricity, respectively, have the lowest levelized carbon intensity of all the power plant options we considered. 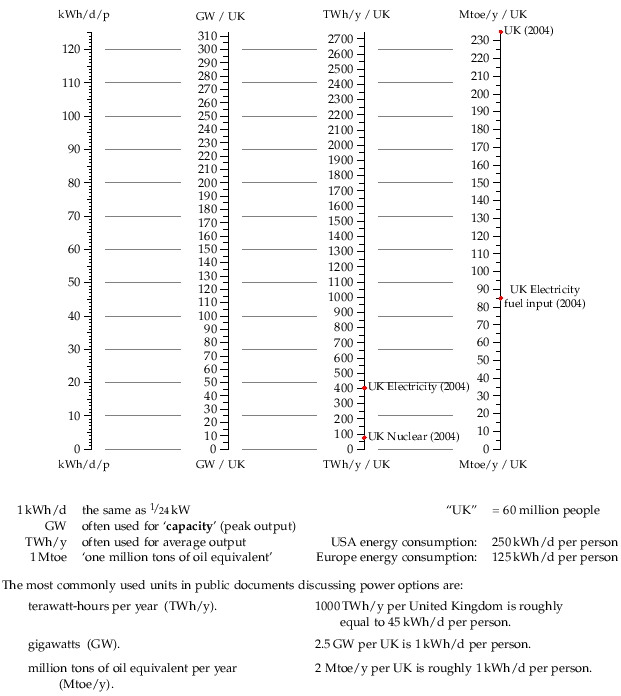 While we have calculated different values for nuclear and wind power, the difference is within the margin of error. Solar energy had the third-lowest levelized carbon intensity, at 41-48 g CO2-eq per kWh of electricity. We tallied the CO2-eq impacts at six stages in a power plant’s lifecycle: 1) upstream, 2) on-going, non-combustion, 3) power generation, 4) carbon sequestration, 5) fugitive methane emissions and 6) downstream. Not all stages applied to every power plant and were omitted from an individual power plant’s charts if they did not apply, e.g., CCS for a non-CCS plant. Data for 1-3 and 6 were taken from NREL’s harmonization of life cycle analysis studies summarized in Table C-1 of Volume 1 of the Renewable Energy Futures Study. That study described the categories as follows. Upstream includes “emissions resulting from raw materials extraction, materials manufacturing, component manufacturing, transportation from the manufacturing facility to the construction site, and on-site construction.” Ongoing non-combustion includes “fuel cycle emissions (where applicable) and emissions resulting from non-combustion-related O&M activities.” Power generation includes emissions “from combustion at the power plant (where applicable) for the purpose of electricity generation.” Downstream includes “emissions resulting from project decommissioning, disassembly, transportation to the waste site, and ultimate disposal and/or recycling of the equipment and other site materials.” Carbon capture and sequestration values are assumed to reduce combustion CO2 by 90%, but CCS plants have more up and downstream embedded emissions because of their larger amount of on-site capital. Fugitive methane emissions were calculated based on the heat rate of the power plant and an assumed 1% leakage rate in US natural gas infrastructure. A global warming potential of 30 was used to convert the leaked CH4 to CO2-eq. Other notable power plant options that we did not consider are hydroelectric, geothermal, and biomass. Hydroelectric power plants are very clean during operation, but have significant upstream emissions from their construction and from organic matter anaerobically decomposing under the reservoir. Geothermal power plants generally have low emissions. Biomass power plants have high emissions during operation, but on lifecycle have low emissions because of the carbon fixed during the fuel’s growth phase. We did not consider any carbon emissions associated with long-term spent fuel storage, which is particularly relevant for nuclear power. We did not consider coal bed methane emissions, though fugitive emissions from the natural gas system were included. The research, published in Nature Energy, measures the full lifecycle greenhouse gas emissions of a range of sources of electricity out to 2050. It shows that the carbon footprint of solar, wind and nuclear power are many times lower than coal or gas with carbon capture and storage (CCS). This remains true after accounting for emissions during manufacture, construction and fuel supply. Critics sometimes argue that nuclear, wind or solar power have a hidden carbon footprint, due to their manufacture and construction. This large “carbon debt”, and the related debt of energy, must be paid off if they are to cut emissions over their lifetime. Factories churning out solar panels use large amounts of electricity, often sourced from coal-fired power stations in China. Wind turbines and nuclear plants need a lot of steel and concrete. And the centrifuges that separate nuclear fuel also rack up a big electricity bill. For coal and gas, these lifecycle energy uses and emissions come from extraction machinery and fuel transport. Significantly, they also come from methane leaks at pipelines, well heads or coal mines. These lifecycle emissions continue, even if coal or gas plants add CCS, which also may not capture 100% of emissions at the power plant. The new research, from lead author Michaja Pehl and colleagues, comprehensively measures the lifecycle energy use and greenhouse gas emissions of different sources of electricity, between now and 2050. It then compares these hidden footprints in a world that cuts emissions in line with a 2C climate goal and a world that stops further climate action. The first stage of the work is to add up the energy needed to build power stations and to provide them with the fuel and other inputs they need to run. This is called “embodied energy use”. It is the inverse of “energy return on investment” (EROI). For example, the study finds that 11% of the energy generated by a coal-fired power station is offset by energy needed to build the plant and supply the fuel, as the chart below shows. This is equivalent to saying that one unit of energy invested in coal power yields nine units of electricity. Nuclear power is twice as good as coal, with the energy embedded in the power plant and fuel offsetting 5% of its output, equivalent to an EROI of 20:1. Wind and solar perform even better, at 2% and 4% respectively, equivalent to EROIs of 44:1 and 26:1. Both fossil-fuel and non-fossil-fuel power technologies induce life-cycle greenhouse gas emissions, mainly due to their embodied energy requirements for construction and operation, and upstream CH4 emissions. Here, we integrate prospective life-cycle assessment with global integrated energy–economy–land-use–climate modelling to explore life-cycle emissions of future low-carbon power supply systems and implications for technology choice. Future per-unit life-cycle emissions differ substantially across technologies. For a climate protection scenario, we project life-cycle emissions from fossil fuel carbon capture and sequestration plants of 78–110 gCO2eq kWh−1, compared with 3.5–12 gCO2eq kWh−1 for nuclear, wind and solar power for 2050. Life-cycle emissions from hydropower and bioenergy are substantial (∼100 gCO2eq kWh−1), but highly uncertain. We find that cumulative emissions attributable to upscaling low-carbon power other than hydropower are small compared with direct sectoral fossil fuel emissions and the total carbon budget. Fully considering life-cycle greenhouse gas emissions has only modest effects on the scale and structure of power production in cost-optimal mitigation scenarios. A 2002 review by the IAE put together existing studies to compare fatalities per unit of power produced for several leading energy sources. The agency examined the life cycle of each fuel from extraction to post-use and included deaths from accidents as well as long-term exposure to emissions or radiation. Nuclear came out best, and coal was the deadliest energy source. The explanation lies in the large number of deaths caused by pollution. “It’s the whole life cycle that leads to a trail of injuries, illness and death,” says Paul Epstein, associate director of the Center for Health and the Global Environment at Harvard Medical School. Fine particles from coal power plants kill an estimated 13,200 people each year in the US alone, according to the Boston-based Clean Air Task Force (The Toll from Coal, 2010). Additional fatalities come from mining and transporting coal, and other forms of pollution associated with coal. In contrast, the International Atomic Energy Agency and the UN estimate that the death toll from cancer following the 1986 meltdown at Chernobyl will reach around 9000. Energy production and consumption is a fundamental component to economic development, poverty alleviation, improvements in living standards, and ultimately health outcomes. We show this link between energy production and prosperity here, where we see a distinct relationship between energy use and gross domestic product per capita. The unintentional consequences of energy production can, however, also result in negative health outcomes. The production of energy can be attributed to both mortality (deaths) and morbidity (severe illness) cases as a consequence of each stage of the energy production process: this includes accidents in the mining of the raw material, the processing and production phases, and pollution-related impacts. We have recently explored this trade-off with respect to development and air pollution. There are two key timeframes to consider when attempting to quantify potential fatalities from energy production. The first is the short or generational timespan, which covers deaths related to accidents in the mining, processing or production phase of energy sources as well as the outdoor air pollution impacts from the production, transport and combustion of fuels. The second is the long-term or intergenerational impacts (and resultant deaths) from climate change. A wind turbine caught fire Tuesday afternoon in Ooltgensplaat on Goeree-Overflakkee, costing the lives of two mechanics.Four mechanics were at work in the wind turbine on the Mariadijk, about 80 meters above ground, Tuesday afternoon. By a cause, yet unknown, a fire started in the engine room. Two mechanics managed to get themselves to safety in time, reported a police spokesperson. Rescuers found the body of a deceased mechanic next to the wind turbine on the ground. This photograph tugs at your heartstrings. Two engineers hug and cling to each other as fire and smoke creeps toward them. They both died after. According to news reports, one of them jumped off the turbine while the other succumbed to the fire. What makes this more heartbreaking is that the two engineers are just aged 19 and 21. Solar panel installer dies after falling through roof Installer Online; Feb 2015? A solar panel installer has died after he fell through a barn roof. His employer Eco Generation Ltd has been fined £45,000 after it was found the company had failed to provide vital safety equipment. Gregorz Sobko had been working on the roof of a cowshed when one of the clear plastic panels, designed to let in light, gave way. The 34-year-old from Southport fell five metres to the concrete floor below and died in hospital ten days later. The Banqiao Reservoir Dam is a dam on the River Ru in Zhumadian City, Henan province, China. Its failure in 1975 caused more casualties than any other dam failure in history. It was subsequently rebuilt. The Banqiao dam and Shimantan Reservoir Dam are among 62 dams in Zhumadian that failed catastrophically or were intentionally destroyed in 1975 during Typhoon Nina. These dam failures killed an estimated 171,000 people; 11 million people lost their homes. It also caused the sudden loss of 18 GW of power, the power output equivalent of roughly 9 very large modern coal-fired thermal power stations. Sources: Yi Si, "The World's Most Catastrophic Dam Failures: The August 1975 Collapse of the Banqiao and Shimantan Dams," in Dai Qing, The River Dragon Has Come!, M.E. Sharpe, New York, 1998. The 2009 Sayano–Shushenskaya hydroelectric power station accident occurred at 00:13 GMT on 17 August 2009, (08:13 AM local time) when turbine 2 of the Sayano–Shushenskaya hydroelectric power station near Sayanogorsk in Khakassia, Russia, broke apart violently. The turbine hall and engine room were flooded, the ceiling of the turbine hall collapsed, 9 of 10 turbines were damaged or destroyed, and 75 people were killed. Coal pollution and its health impacts travel far beyond borders, and a full coal phase-out in the EU would bring enormous benefits for all citizens across the continent. That is according to a new report published today by the Health and Environment Alliance (HEAL), Climate Action Network (CAN) Europe, the WWF European Policy Office and Sandbag. The report, ‘Europe’s dark cloud: How coal-burning countries make their neighbours sick’, analyses the health impacts from air pollution of all EU coal-fired power stations for which data is available (257 out of 280). It reveals that in 2013 their emissions were responsible for over 22,900 premature deaths, tens of thousands of cases of ill-health from heart disease to bronchitis, and up to EUR 62.3 billion in health costs. Germany – home to the much-hailed ‘Energiewende’ green revolution – suffered more premature deaths linked to coal plant pollution than any other EU member state, research by health and environment campaigners has found. Analysis of 257 of 280 coal-fired power plants in the EU found that their 2013 emissions caused over 22,900 deaths, tens of thousands of illnesses from heart disease to bronchitis, and up to €62.3 billion in health costs. 3,630 people in Germany died from coal-related illnesses in 2013, according to the report by the Health and Environment Alliance, Climate Action Network Europe, WWF European Policy Office and Sandbag. A dike failure at TVA's Kingston Fossil Plant led to the largest spill in history.